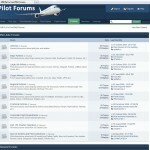 We have recently updated our pilot forums section of our website. We are sure that you will find this new updated version to be easier to read and very user friendly. Unlike many other pilot forums websites, ours is still FREE! We hope that you take advantage of this excellent resource. To help jump start our new forums, we are offering a free membership to one of our forum members that makes a post this month. We will randomly choose one member from all the members that post in the month of October. Each post will count as another entry, so the more you post the more opportunities you have to win!